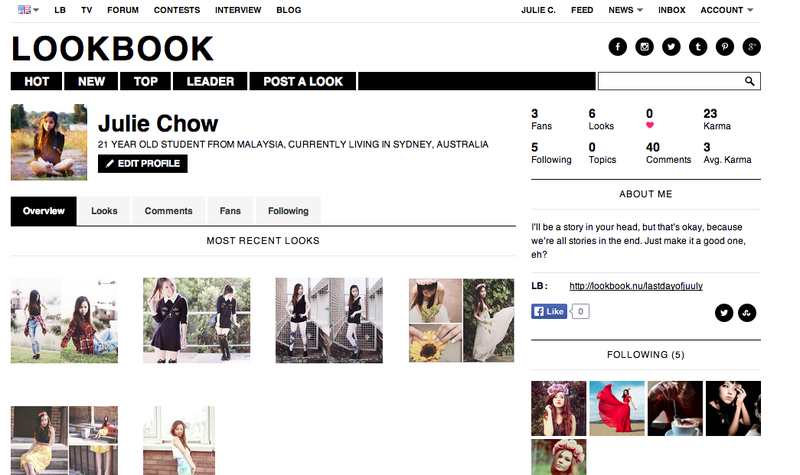 long stories about short people: Why do you Lookbook? A common question I get from people who live with me or from people who have seen my Lookbook updates on their newsfeed is "Why are you doing this?" or sometimes "What is Lookbook?" I always feel embarrassed when I have to explain myself because let's be honest, unless you make it big, you're really just playing dress-up. I thought about this and I realised well, maybe playing dress up is better than not playing at all. I've toyed with the idea of starting up my own Lookbook profile ever since the site started and was exclusive to a select few. But despite the interest, I never got around to it. One night when I was stressing over an essay I had to write, I decided to take a 10 minute break and visited Gary Pepper's blog. At this point, a friend came over and we had a discussion about fate and destiny and life and the concluding remarks he made was this: being a fashion blogger may never be my fate so there really isn't any point trying. That really set me off because there is a possibility that this degree I'm studying for may not be my fate either. In that case, why am I still trying? It was disheartening to realise that no matter how much time and energy we invest into something, sometimes life just doesn't pan out that way. We might end up in a 9-5 job that we hate, surrounded by people who couldn't care less about us and slowly letting go of the dream life we've always wanted. I understand that our dreams and goals need to be realistic, but at some point you need to ask yourself, which astronaut has ever dreamed of touching the moon with the mentality that it was impossible? I'm not saying being a model or fashionista is my dream (guys, I am aware that I am 5 feet tall), but that's not my motivation to begin with. Lookbook to me is a fashion diary for people to share looks and outfits and style ideas, not one where we compare photography skills and physical beauty. I don't upload photos thinking OH HOT DAYUM, I upload them for the same reason I browse through the feed. I learn to put things together from the very little I have and the creativity keeps me going to look out for more outfit ideas. So yes, maybe it's not the most conventional hobby or the most humbling one, but not every hobby that involves the physical self is vain and egotistical and self-indulging. Maybe sometimes a tiny asian girl who is two sizes too small and two heads too short enjoys putting different looks together, capturing it and hopefully inspiring style ideas of other lookbookers, just as much as they have inspired hers. I take a lot of hate from people who judge me for being a part of a community that involves taking portraits of themselves, but if people take the time to know me outside of my lookbook account, they would know that my motivation has never been in superficial beauty or materialism. I express myself through fashion (and music!) and it doesn't take a genius to figure out if I'm having a good day (lookbook update days) or a bad one (pajamas day), so why shouldn't I be a part of a community that share the same interests? So in conclusion, I Lookbook because, why the hell not.